Earlier this week, with Christina working late, I found myself playing a fair bit of Europa Universalis 2. 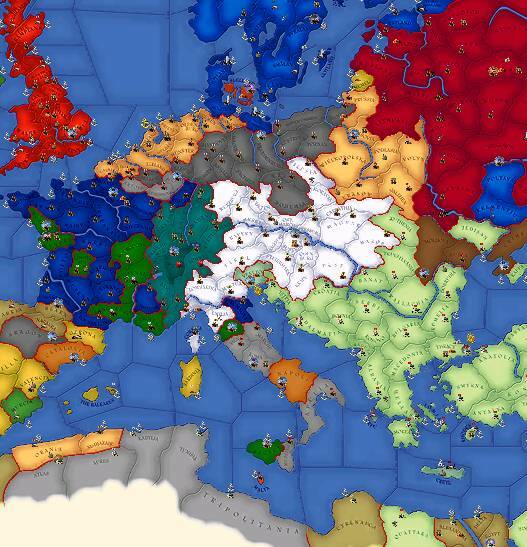 This is a strategy game recreating European politics and wars from the early 15th century to the early 19th century. In honor of our recent trip to Switzerland, I decided to play, well, Switzerland. 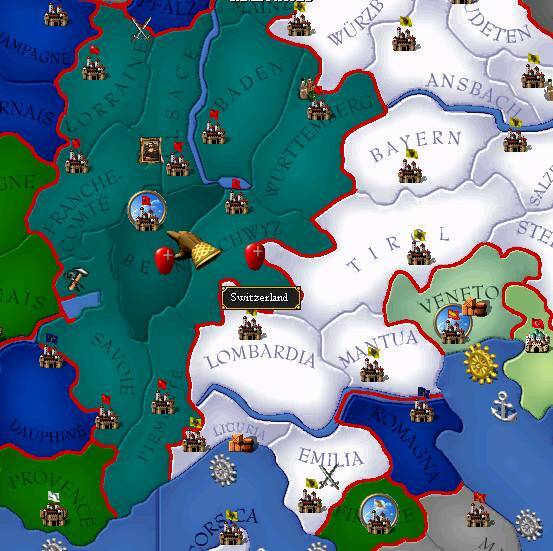 I admit to playing on the easiest level; my excuse is the game's historical fidelity is so good, it would otherwise be impossible to expand beyond the two "provinces" of Bern and Schwyz. Here is a look at our holdings in the early 18th century. Here is a look at the larger European picture. The white blob to my east is the Austrian Empire, my continuing nemesis. I'm in a little bit of trouble because they're more technologically advanced than we are (but we have these marvelous knives! ), and my main ally has been France (the blue blobs to the West), but they've been weakened by rebellions, and for some reason they're not too fond of me any more.